John Barrows grew up in Pacifica CA, and has been painting since he was five years old. His interest in art began when his father did a few paintings and his mother showed him art books in the local library. He took his first art class in the seventh grade and continued his art education through to earning a BFA in Illustration from the San Francisco Academy of Art University. John is trained by master artist Fiorello Tossoni in the techniques of the 19th Century Italian Macchiaioli painters. The first piece he sold was to his high school art teacher. John’s talents take him to a wide variety of work in art including portraits, murals, backdrops, illustrations and of course fine art. He is now the art consultant for Imitationfruit.com, an online literary journal and is doing work for Science Fiction/San Francisco (SF/SF). SF/SF once ran an article about John detailing his art background. 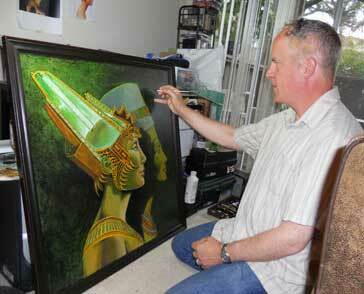 John is a member of the Association of Science Fiction & Fantasy Artists (ASFA). John has been recognized for his fine art and illustration work from galleries that he has displayed his art with. He also has over ten years of experience as a computer artist although he prefers traditional media. Studied the techniques of the Old Masters with master painter Fiorello Tosoni in Todi Italy. Master Tosoni commented that John chose difficult subject matter but did it well. Graduation art show at the San Francisco Academy of Art college gallery. The Old Firehouse gallery where he received several first and second place awards. Exhibition at the Triton Museum of Art in Santa Clara, CA. Art direction for the movie It’s a Digital World filmed at Universal Studios. The movie shows several paintings that John did for it. Over twenty years of freelancing with illustration and fine art.